This report allows you to query the virtual private cloud (VPC) flow log data for specific event details by applying location, source, destination, and other filters. 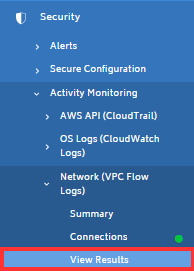 From the left navigation pane, choose Security > Activity Monitoring > Network (VPC fLow Logs) > View Results. The VPC Flow Logs – Events page opens. Click Options, Location Filters, Source Filters, Destination Filters, and Additional Filters to see the parameters that you can configure. When you are done selecting your options, click Show Results. In this example, we filtered by a selected account, resource, and interface for data during the month of January. The events for selected time period are displayed. Hover over a selected date to see more details.